Phlebotomy technicians are a group of professionals that play an integral part in the allied-health community. These professionals provide the initial steps necessary in the diagnosis of diseases. Such professionals work cooperatively with physicians by providing accurate, diagnostic testing procedures. These testing procedures provide the identity and exact nature of various diseases or medical conditions. Upon the result of such testing procedures, a physician can provide the appropriate course of medical treatment. In order to implement diagnostic testing procedures, a phlebotomy technician must utilize his or her professional skills. These skills include the proper use of common equipment and the performance of accurate venipuncture techniques. Some phlebotomy technicians must also make use of a centrifuge. Any specimen collected may need to be transported to a specified laboratory facility. This is usually the case when specimen samples are collected in a setting other than a laboratory facility. As a phlebotomist in training or a phlebotomist who has finished his or her course of study, this is an easy and relatively fast way to enter the healthcare industry. As such, training in this field could lead to an entry-level position in the chosen field of study. However, becoming a phlebotomist is not the only means by which to enter this industry. There are many alternative career paths that provide an opportunity for individuals to enter the medical field. Medical technologists and medical lab technicians are professionals in the medical community that exhibit job-related duties similar to that of a phlebotomist. These individuals are laboratory professionals who must prepare specimens for various laboratory tests. These tests include diagnostic testing procedures. This procedure is necessary to detect and diagnose the cause and nature of a particular disease or medical condition. This will ultimately lead to an appropriate course of medical treatment. As these careers relate to a career in phlebotomy, individuals who work as a technologist or a technician must also utilize their professional skills of manipulating various equipment used in phlebotomy procedures. That includes syringes, evacuated tubes, centrifuges and microscopes. The use of said equipment may depend on the individual’s course of study in addition to his or her specialty. The accurate use of such tools is pertinent in determining the accurate cause of a disease. An individual who works as a patient care technician, commonly known as a PCT, has some job responsibilities similar to that of a phlebotomy technician. Among the many duties that a patient care technician must perform, these professionals must be proficient concerning the proper use of equipment. These professionals must also perform accurate venipuncture procedures. In addition to these duties, a patient care technician may be responsible for connecting patients to cardiac monitors and EKGs. They may also be responsible for connecting patients to an oxygen monitor, administering oxygen and dressing wounds. The responsibilities of a PCT may vary depending on their place of employment. 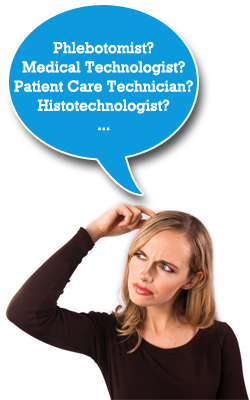 Histotechnologists and histotechnicians are laboratory professionals who work with body tissue. These individuals work collaboratively with pathologists in a laboratory setting. Histotechnologists prepare biological tissue for pathological examinations. These exams are performed by physicians who specialize in the diagnosis of diseases. Histotechnologists have the responsibility of examining biological tissue once it is surgically removed from a patient. During this biopsy procedure, the tissue is examined in order to detect and diagnose disease-causing micro-organisms known as pathogens. During this time, the extent of a disease is also determined if applicable. Histotechnicians assist with such procedures under the supervision of a histotechnologist. An individual who works as a dialysis technician has a career similar to that of a phlebotomy technician. Dialysis technicians who perform hemodialysis must use his or her laboratory skills to purify the blood of patients diagnosed with kidney failure. The purification process involves the use of the equipment that is needed to gain access to a vein. This intravenous procedure allows a technician to collect waste products from the bloodstream of such individuals. Such unwanted material is toxic to the body and therefore detrimental to human life. In addition to the removal of such toxin, excess water is also removed from the bloodstream. An intravenous technician or IV technician is a medical professional who has the job responsibility of starting an intravenous line. This line, commonly known as an IV, is an injection or insertion into a vein that will allow the process of administering medication. As this procedure requires an incision into a vein, it is similar to the incision step performed by phlebotomy technicians. The skills learned in phlebotomy courses will benefit intravenous technicians. The job of a pathologist assistant is to aid a pathologist in examining the biological tissue of patients and corpses. With patients, these tissues are examined in order to detect a disease and allow such findings to be given to a physician. Upon receiving the results of such examination, a physician will take the necessary steps in providing treatment if applicable. With the deceased, responsibilities include autopsies. This is an examination of a corpse that is performed with the intention of determining the exact cause of death. Other duties may include administrative work such as filing and recordkeeping. In the field of allied-healthcare, there are many careers related to phlebotomy. As these careers consist of various training and credentials, many of these careers require the skills learned during a phlebotomy program. Knowing how to use common equipment in addition to locating and accessing a vein of interest, are key in performing many of the technician jobs previously noted. These key points show how phlebotomy relates to many other careers in the healthcare industry. Although phlebotomy is one way to enter the healthcare industry, these alternative career paths will accomplish the same goal.